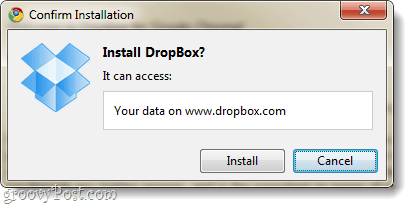 “An extension for Dropbox? 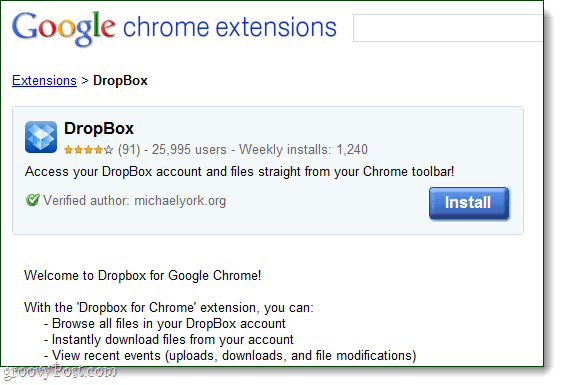 !” Being a huge fan of Dropbox, I was riddled with excitement when I discovered that there was a working Chrome extension for it. However, after checking it out, this review is going to be a lot more critical than I had initially planned. 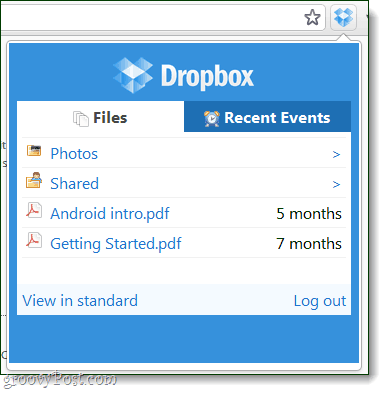 The extension is useful, but really only if you need to manage more than 1 Dropbox from 1 computer; such as if you needed to access a work-related Dropbox, and a personal one from your primary laptop. Below we’ll give it the full review, let’s get started. If you’d like to test it out, you can download the Dropbox extension for Chrome from Google’s official extension website. Just Click the blue Install button and Chrome will start an automated setup for you. Warning: Watch out for the fake copy-cat DropBox extension found here. See our post on chrome extension privacy to learn more. After you’ve confirmed installation, just wait a few seconds viola, it is already done! The DropBox extension adds tiny blue Dropbox icon right next to the Settings (wrench) button in Chrome. Click the new Dropbox icon to get started. First you’ll have to login to the account you want to have on-the-fly access to. 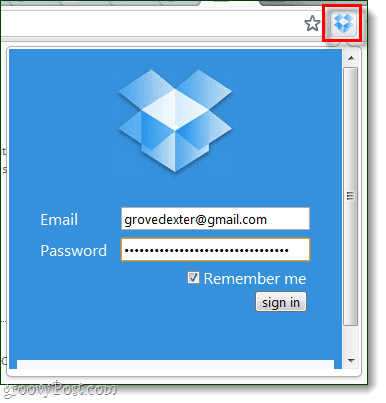 If you Click the Remember me button it will keep you permanently logged into Dropbox.com. And in case you are wondering, the “View in standard” button just opens up the normal Dropbox.com website in Chrome. The DropBox extension has 2 different views: Files, and Recent Events. The files view will allow you to browse through your Dropbox and access all of your files. Even though some files may open directly in Chrome, most will just save straight to your default Chrome Downloads folder. This is why the plugin is mostly useful for Dropbox accounts that are not synced up to your computer. 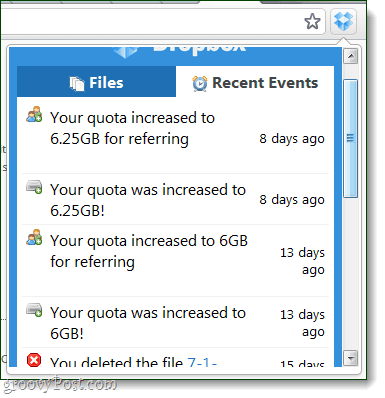 The Recent Events view shows recent changes made to your Dropbox account, including file modifications, quota increases, and certain messages from the Dropbox team. The DropBox extension for Chrome adds some decent usability if you are trying to manage 2 separate Dropbox accounts from one computer. However, its usefulness completely nullified if your computer already has Dropbox software installed and synced up. Hopefully we will see this extension get a good number of updates that should improve upon that. If they can build a reputable standing regarding privacy, I think this extension has some groovy potential –but that could take a while. The cloudHQ service provides Chrome browser extension. It enables access for Dropbox files directly in Google Docs (synchronization, backup, copy/move etc.). Thanks for the FYI Selim – BTW – just posted a review of CloudHQ on the blog. Feel free to add anything you think we might have missed!